You know what really works for me? A blog carnival dedicated to honoring your hubby! I am happy to participate in Kristen's S.W.A.K. Valentine's Carnival today. 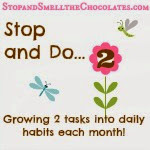 You should check it out and see how other ladies are honoring their hubbies. I am so grateful to be married to my husband. He is a godly man, a great husband and father, a good employee, and many other things. He works hard to take care of our family and still manages to smile and crack jokes frequently. When people ask how we met, I tell them that I got him in the Men's Department in J.C. Penney! And it's true!! When I moved to California - my first job was at J.C. Penney. On my first day of work after training, I was introduced to all the employees in the Men's Department where I was scheduled. Guess who I met? A very tall, nice young man with a kind smile and a great sense of humor. We became good friends and the rest is history. I always think it's amazing that the day he met "the new girl", he had no idea that he would be "stuck" with her the rest of his life! I can now look back on this and see that the reason that I moved out-of-state and away from family was to meet the man that God intended for me. I am delighted to say that we have been happily married for over 16 years! Thank you Lord! My husband may not be perfect, but unfortunately for him - neither am I! He is patient to put up with my housework struggles, my grumblings about daily life, my tendency to create large stacks of paperwork, my need for fancy coffee drinks, and my love of blogging. He is willing to help me when I ask, even if it's to kill a nearby spider or to take a photo for my blog! My husband is my best friend and I can talk to him about anything...except clothing, or new hairstyles, or makeup, or whether an outfit makes me look fat - Well, I COULD talk to him about those things too, but he is happier when I don't! I enjoy spending time with him, even if it's in silence. I get comfort just from the fact that he is there with me. I love you honey and am thankful for all that you do! I am blessed to have you for my hubby! You can honor your hubby too and link it up to the S.W.A.K. Carnival at We Are THAT Family. 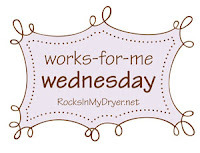 And be sure to check out more Works-For-Me-Wednesday ideas at Rocks In My Dryer! Sounds like you got a good one too!!! This is a wonderfully sweet post. I feel like I could have written much of it to honor my husband! What a lovely post about your hubby! I just got up because of hacking all night. I should write how good my husband was to put up with that!! Thanks for sharing. Over the course of 30 years, I have learned there are some things just not to ask about! LOL. Lovely post. Your husband sounds like a great man. Honoring your husband is definitely something I know I need to do a little more of. Thanks for sharing! Aw...happy Valentine's Day to you both! Great post my friend! How sweet! My poor hubby is headed to the doctor today. He was not feeling well this morning. I'll have to check you out @ Chic Critique. Sounds interesting! Take care my friend! I hope you are having a great week! Such a sweet love letter! Sigh. Thanks for sharing it with us, you got me all inspired for Valentine's Day. 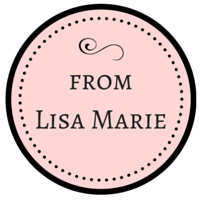 Our hubbies are so important, what a sweet thing for them to read a love letter on our blog. I think its so important to remind our husbands how much we love and respect them. All too often we let life happen without showing our appreciation for all they do for us and our families. Thanks for sharing! What a terrific tribute to your hubby! And thanks for sharing it on Works for Me Wednesday! any hubs that understands a NEED for fancy coffee drinks and a love of blogging is a KEEPER! great story. Love the story. Funny, my hubby worked at JCP too when I met him! 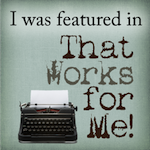 I forgot to invite you to swing by my site and read my story too! Uh hem! I'm here to comment on today's post! I know my post was a bit later than usual but I have a valid excuse and a teachers note! LOL. Okay so just copy and paste this comment in today's post when it comes up will ya? LOL. Just kidding. I'm sure I'll be back. I think I am going to start telling my single friends to apply at Penneys :) Isn't it amazing that God puts us right where he wants us? Just started looking at your blog. This is the sweetest message. The love that both of you share is amazing and I know for sure it will continue to grow. I'm sure your hubby will have a lot more to pen to honor you.